Editing. Editing is key in director Tom Ford's follow-up to his 2009 debut A Single Man titled Nocturnal Animals as the narrative begins by introducing Susan Morrow (Amy Adams) as a woman who seemingly has it all together, but whose world it tears to shreds in less than two hours. It accomplishes such a visceral effect on the viewer due largely to the skill in which it is cut. To unravel the neatly wrapped facade of Morrow's life is to cut back and forth between her present timeline, her past detailing how she reunited and fell in love with first husband, Edward Sheffield (Jake Gyllenhaal), as well as the story in which she is reading. The key factor being the story that she is reading comes to her from Sheffield as a novel he wrote that will soon be published, but as it was inspired by Morrow he thought she deserved to read it first. The book, also titled "Nocturnal Animals", is the story of a family on a road trip whose car is hijacked by a band of troublemakers that includes a nearly unrecognizable Aaron Taylor-Johnson where terrible things happen. The representation of this novel as put to screen is what will come to garner the most attention from the viewer as it is high-tension drama filled with moving and effective plot points as well as performances. What makes Nocturnal Animals, the film, more than just a stirring adaptation of the work within the work though, is the foresight it utilizes in the outside stories and how they will influence our reactions to the actions taking place within that most engaging storyline. How is this accomplished though? How are these two outlying narratives so effective in both supporting and drawing from the narrative that undoubtedly holds the weight of the film on its shoulders? Through the editing. The film is cut in such an extraordinarily unpredictable fashion that, as an audience member, when it cuts we are never allowed to know what it might be cutting to. There are even long pauses that fill the screen with darkness designed to make the audience think a certain segment is over only to drop us back into the same story moments later. This unpredictability not only ups the tension in terms of seeing where certain plot strands might go, but in ultimately structuring the story in such a way that when the payoff for everything each of the three individual storylines has been building to finally arrives it hits you. And I mean really hits you. Nocturnal Animals is an exercise in sheer audacity and nearly every one of its risks pays off. Susan Morrow (Amy Adams) sits idly by as others enjoy the opening night of her new art show. And that is only discussing the single aspect of the editing in the film which ultimately relies on everything else in the process of making the film to have been done right for the editing to work as well as it does here. That is not even to mention much of the performances from an across the board stellar cast or the drop dead gorgeous cinematography that combines Ford's flair for the stylistic with the photography skills of Seamus McGarvey who has worked as the cinematographer on many of Joe Wright's films as well as on big budget blockbusters like The Avengers. That is not even to mention the classy yet cutting score from Abel Korzeniowski or the lush dialogue adapted from Austin Wright's novel of the same name by Ford himself. For a director who is only working on his second film and his first in seven years, it seems Ford has a very clear vision for the types of stories he wants to tell, but almost more importantly is his vision for how he wants to tell those stories. To tell this story in the way his brain no doubt imagined it as he read through the novel the first time Ford begins by framing the life of Morrow as one filled with absurdities meant to be enjoyed and indulged in while pushing one's thoughts of happiness or what (little) value they might be bringing to the world out the window so as to ignore the harsher life those existing outside their bubble deal with. Morrow says in the beginning that despite not being happy that it would seem, "ungrateful not to be happy. I have everything." And this is true from an outside perspective-the woman seemingly has all she could ever dream of: a job curating an art gallery, a sleek, modern home in the Hollywood hills that she shares with handsome husband Hutton (Armie Hammer), and friends such as Carlos (Michael Sheen) and Alessia (Andrea Riseborough) who flaunt the absurdities of their lifestyle to full effect; possibly leaving Morrow to only further question her decisions and if they've been true more to herself or more in accordance with her mother's (Laura Linney in a brief, but stinging scene) wishes. This superficial world of hers comes crashing down the further she reads into her ex-husband's novel revealing itself to be an introspective truth Morrow had hoped was long forgotten and that she'd long repressed. As Morrow's history is peeled back Adams is left with little more to do than sit in various environments within her house and look both enthralled and stunned as she reads on, but what makes Adams performance noteworthy is that of the character development she is able to unfurl in the limited amount of screen time her younger self is given during the flashbacks chronicling the rise and fall of her relationship with the young Sheffield. It is in these brief sequences that we also see only glimpses of the man that informs who Gyllenhaal plays as the protagonist in his own novel. Gyllenhaal gives the young Sheffield a slight twang, a comfortable stride, and strict code of thinking, but there is also a humility to the guy-something one can tell will influence his writing in a positive way where things don't need to be flowery or pretentious, but more straightforward and very matter of fact. A no frills approach that won't hide his writer's intent, but rather will gut you where it hurts the most. All of this, glimpsed through small moments at the beginning of the relationship between Morrow and Sheffield, is played particularly by both Gyllenhaal and Adams as their scenes together are placed precisely where Ford wants them so as to build the dynamic to its breaking point just as the story Sheffield is telling in his novel reaches maximum violence and grief. 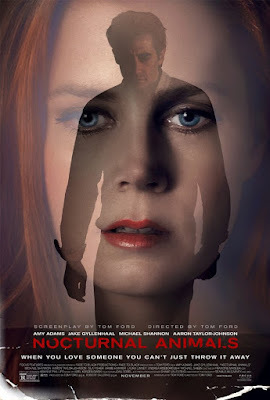 As stated, the editing is more than commendable and ultimately what makes the film work as effectively as it does, but right near the top of the list of reasons the film works so well is how strangely compelling the story of Nocturnal Animals the novel is. Would it be as compelling without the framing devices and points of reference? Absolutely not, but that's why the film is such a unique, introspective, and bold piece of work. 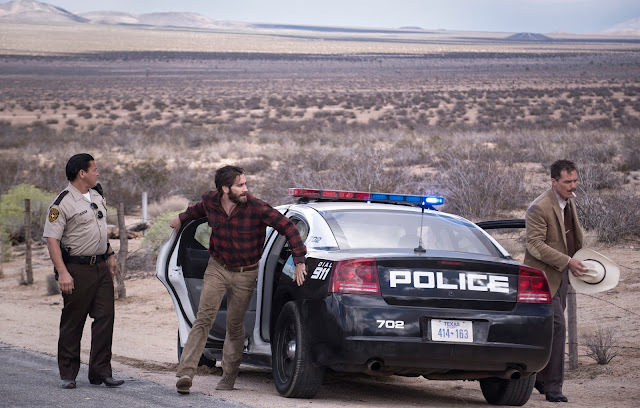 In the main narrative that makes up Nocturnal Animals we are privy to the story of Tony Hastings (Gyllenhaal) as he and his wife (Isla Fisher) and daughter (Ellie Bamber) set out on a road trip across West Texas. Traveling through the night rather than stopping to rest, Hastings and his family encounter a gang led by a long-haired, crazy-eyed schizophrenic by the name of Ray Marcus (Taylor-Johnson) who runs them off the road. One thing leads to another and without giving anything away law enforcement becomes involved in the form of Bobby Andes (Michael Shannon). Tony Hastings (Jake Gyllenhaal) rushes from Detective Andes' (Michael Shannon) squad car to recount events of the previous night. It is in this story dealing with the Hastings clan, that of Ray Marcus, and the classically dismissive type that Shannon perfects with his ailing Texas Ranger that the film shows its real merit. It is within this narrative that we are shown the decisions and misfortunes that have led not only to the Hastings' sad predicament, but that of Morrow's seeming constant grief. What is so curious of the story within the story narrative here though, is that we're not sure where things are going the moment they take off. The first time we glimpse Gyllenhaal as Hastings we're unsure whether or not what we're seeing is a parallel storyline or the novel brought to life. There are no indicators as to what direction we're heading, so when Hastings and his family all of a sudden and for no reason find themselves at the mercy of Taylor-Johnson's Marcus we are beyond frustrated at the situation, but more it is made all the more tense by the fact we're unsure whether what we're seeing is real or not. Of course, as we learn that what is happening is intended to mirror the history between Sheffield and Morrow's characters things begin to fall more into place, but that doesn't make it any less riveting. In this dual role, these two different angles on essentially the same man Gyllenhaal shows why he is again one of the best actors working today. Hastings is a man unable to chase away his anxiety even when he comes face to face with pure evil. Hastings is the personification of the man Morrow's character repeatedly called weak and "Nocturnal Animals", the novel, is Sheffield's analysis and evaluation of himself that accounts for his supposed weakness, but comes from a place of cynicism-a place Morrow knows much better than he. In one of the few flashbacks Morrow reads over Sheffield's work only to offer him the advice that, "maybe you shouldn't write about yourself." Of course, all writers write about themselves-it's inescapable, but with his novel Sheffield is able to write what he knows while giving Morrow insight into how other people see how she sees herself. It's a perspective that quickly gets confusing, but which Ford makes clear in his intent to open his female protagonist's eyes to just how much Morrow's life turned into something she never intended. Shannon being pitch-perfect in his role and Taylor-Johnson being genuinely unpredictable in his only adds to the overall pristine quality of the story while the score lends the film a real presence that allows the entire experience to feel like a symphony that builds tensely until it crescendos-culminating in one of the most devastating shots and realizations in film all year.